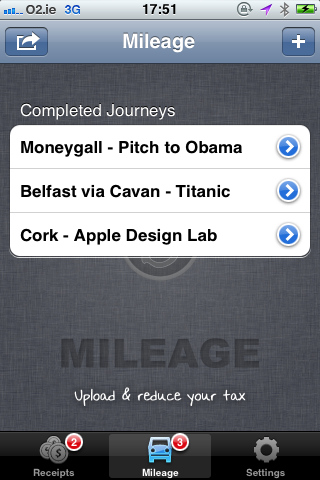 Here is a preview of our new iPhone App for Mileage & Expenses. The idea of the 3 part blog is to give people thinking of building an app a little insight in to why we did what we did. Like why we dumped our original custom design for speed, how we used splash pages to still give the app some identity and how we make Tax a positive user experience. This blog series is broken into 3 posts which will be dilvered over the next 3 days, don’t forget to signup and get them in your inbox. The first was recording mileage in an easy way – the average businesses does about 10,ooo miles a year, so that’s worth about €6,500 in expenses or non taxable income. Think about that for a second. The second pain point was receipts, wallets and wallets of legitimate receipts. Again, you can’t be bothered entering them or by the time you remember to, they’re a mess and faded. You can have a look at this 2 minute video on how we manage expenses in Bullet. So lets look at mileage. Here’s what we wanted to do. Take advantage of smart phones and a beautiful billion dollar free service called GPS. Have a play on the check-in idea we’d seen in other social location based app’s, especially for say plumbers who mightn’t do long trips but lost of short trips. 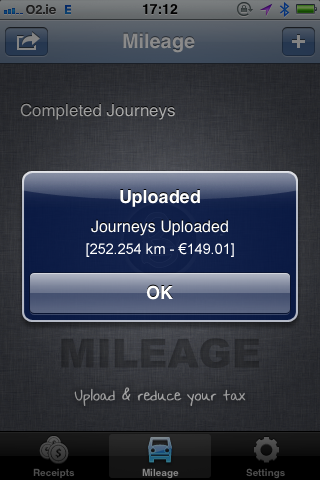 Integrate into your bullet accounts account by automatically adding the mileage expenses to your wages. Remember, with Bullet our goal is to automate your accounts. Show you instantly how much you’ve saved, giving you an instant reward and getting that stickyness in the app. Have a visual way of doing your mileage. 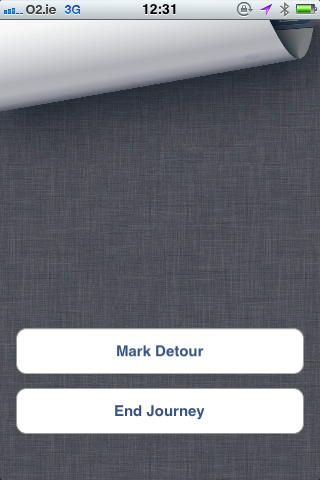 We also wanted to use default buttons for speed in development, and running but have our own branding on it. Fig 1. 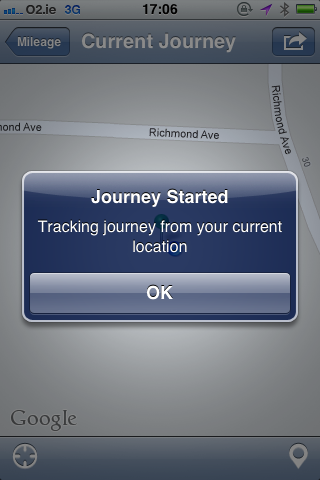 Once you kick off a Journey we check your current location, trickier than you think. We didn’t want to constantly track your phone, since that hogs battery life and data, and the iPhone tends to cache locations, so it took a bit of time to get it work. Fig 3. 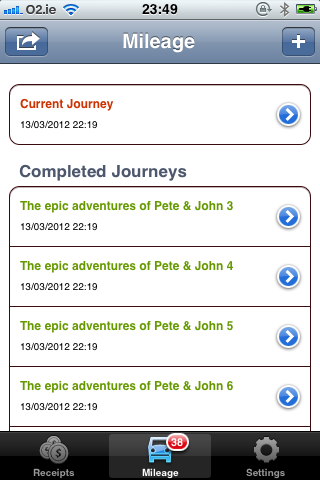 Here is the screen with all the journeys you’ve done prior to uploading. When your eye lands on the below screen, you don’t know where to look and the only thing that would grab your eyes are the arrows, and that’s really not what we’re looking for you to do. So by simply adding the background (see above) I focus you on the only aspect of this screen you should be looking at: the journeys. Simple! The other point is we stripped out the date and time; sure it’s important if you did 2 trips with a similar name like in this mock data, but that is unlikely to happen, and clicking on the arrow will show you the live journey on the map. So lets focus on the core thing: ‘its name’. By focusing on the name, we get space so we can increase the font size, which gives the impression of big, easy, no brainer buttons. You’ll notice in Bullet we’re big on big, easy, fisher-price buttons. Fig 4. Once you upload the journeys, we do a couple of things instantly. 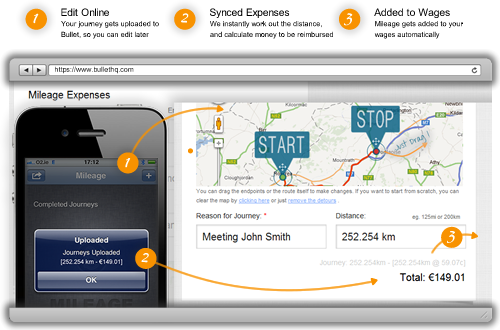 We calculate how much that journey is worth to you – sticky rewards and make you click it. We upload it to your account in Bullet. We add it to your expenses so when you pay yourself or an employee, it’s already sitting there. 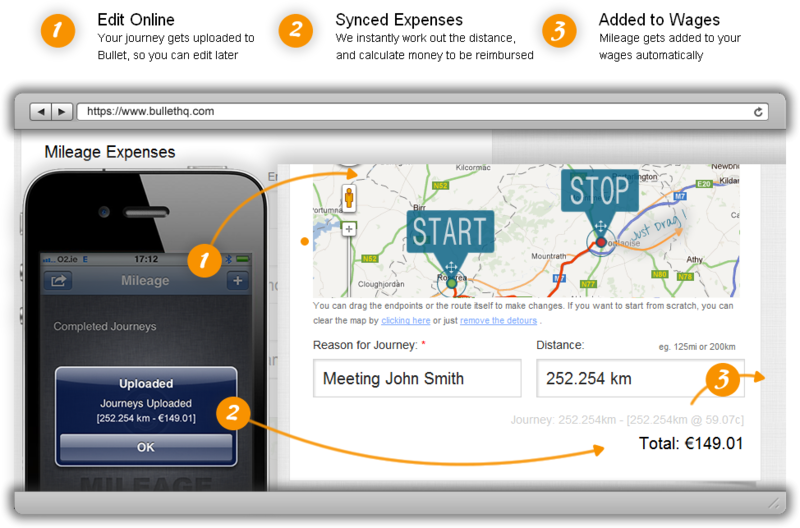 You can also edit journeys within the Bullet website; this mean we can keep the app interface simple. You can watch this 2 minute video which will walk you through the process of doing your mileage in Bullet. So that’s a snap shot of our first iPhone app, signup to our blog for the second part where we talk about how we managed receipts, and how we simplified expenses. Let us know your thoughts we’re always looking to get feedback?